Home | Resources | FAQs | How Does Ventilation Work? Ventilation is accomplished by introducing ‘clean’ air into a space. This air is either mixed with the air already present in the enclosure to give ‘mixing’ or ‘dilution’ ventilation, or is used to ‘displace’ air in the space to give ‘displacement’ or ‘piston flow’ ventilation. These techniques give characteristically different pollutant profiles. Mixing ventilation: Mixing is stimulated by natural turbulence in the air and (in the case of mechanical ventilation) by the design of the air supply diffusers. Mixing ventilation is especially important when recirculation is used to provide thermal conditioning. If mixing is perfect, the pollutant concentration is uniform throughout the space. 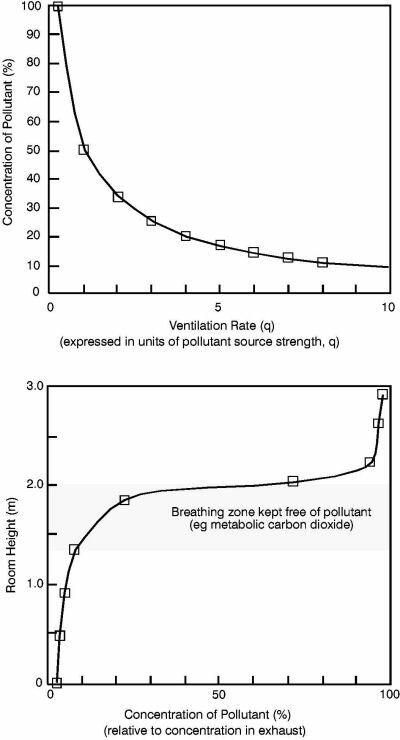 The relationship between ventilation rate and concentration of pollutant (assuming a constant emission rate) is illustrated in Figure 1.1(a). Displacement ventilation: Displacement ventilation methods are becoming popular in some Countries for offices and other non domestic buildings. In principle they are more effective at meeting ventilation needs than the equivalent mixing approach, however air cooling or heating capacity is limited by nature of the need for careful thermal control of the supply air temperature. Additional conditioning is typically met by radiative ceiling panels. Unlike mixing ventilation, the spatial concentration of pollutant within the space is non-uniform, with air upstream of the pollutant source being uncontaminated while the air downstream of source may become heavily contaminated. Good design is aimed at ensuring the separation of occupants from polluted air. A typical pollutant profile is illustrated in Figure 1.1(b). In this example, pollutant build-up (e.g. metabolic carbon dioxide) is kept above the occupant breathing zone. In practice some mixing inevitably occurs. Very careful air flow and temperature control is needed to inhibit mixing. Contaminants upstream of the occupied space or ‘breathing’ zone must be avoided. Examples of such pollutants include floor level contaminants and emissions from floor coverings and Good ventilation is a major contributor to the health and comfort of building occupants. Interzonal ventilation: In dwellings, it is common to extract air from ‘wet’ rooms such as kitchens and bathrooms. Fresh ‘make-up’ air is then drawn through air inlets or mechanically supplied to living areas and bedrooms. This induces a flow pattern that inhibits the cross-contamination of air from ‘polluted’ spaces to ‘clean’ spaces. Similar examples apply to clean room and hospital applications. Short circuiting: If a ventilation system is poorly designed, ‘short circuiting’ may occur in which fresh ventilation air is extracted from the building before it has mixed with or displaced stale air. This can occur if air diffusers and outlets are positioned too close to each other or, in the case of displacement systems, the supply air temperature is higher than the room air temperature.